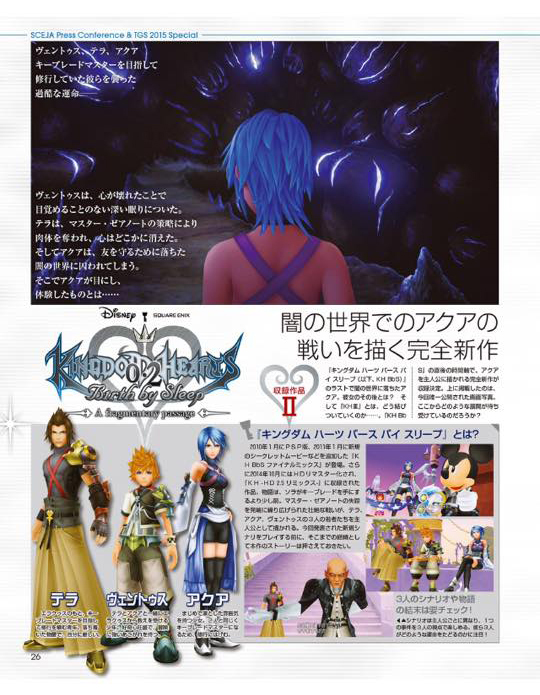 Famitsu wasn't the only one to get an interview with Tetsuya Nomura on Kingdom Hearts HD 2.8 Final Chapter Prologue! Dengeki Playstation also had the opportunity to poke his brain for some new information! Most of the questions did overlap with Famitsu so we've filtered out the new ones for you to read below, with translations by Zephyr. 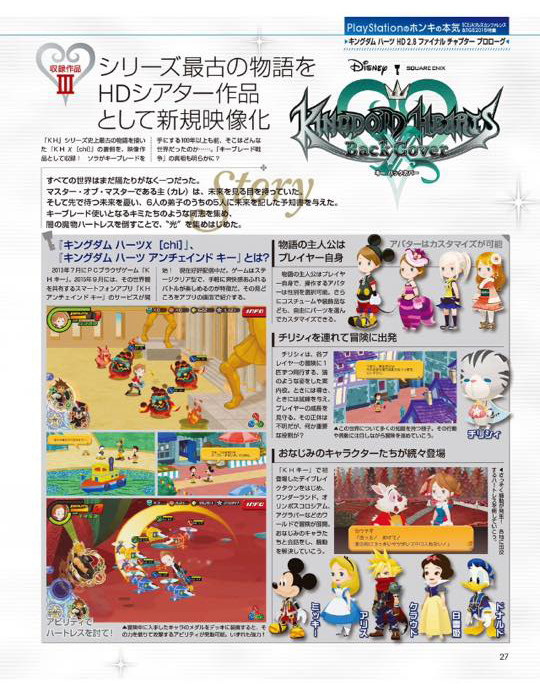 The footage of KINGDOM HEARTS χ will be completely new? Nomura: Yes it will be completely new. Being made with KINGDOM HEARTS III’s tech, the characters that appear are all new characters. You will hear the Foretellers’ and Chirithy’s voice for the first time; the casting, model production, scenarios, they are all made from scratch. However in regards to this scenario, it was written at the same time as the main scenario for KINGDOM HEARTS χ and was meant to lead into that story. Because of this, those who are playing KHχ can better grasp the timeline. What is the intention behind the title “Back Cover”? Nomura: Because KHχ and KHUχ are made from the concept of a "fairy tale story”, the back side would be called the “back cover”. As KHχ and KHUχ would be the front side told from the players’ point of view, the back side would be told from the Foreteller’s perspective. What kinds of content and highlights will we see in the footage and how far does the extent of the volume go? 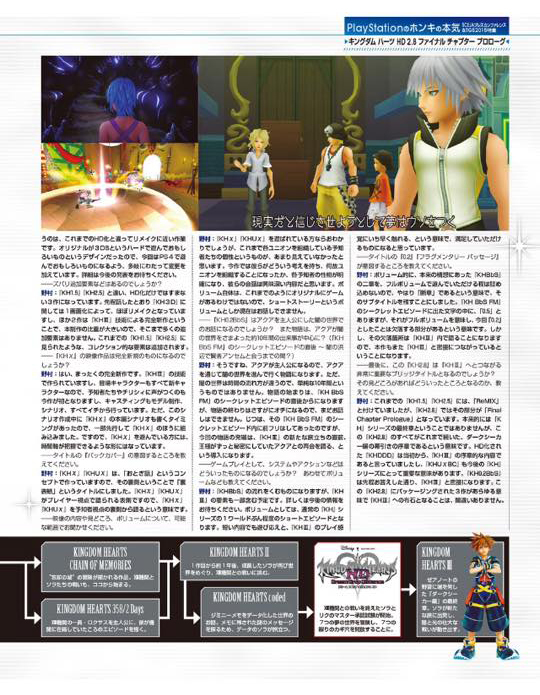 Nomura: For those who have played KHχ and KHUχ, it didn’t reveal much of each of the Foretellers personalities. In this work, each of them will say what they think, why the unions were organized, the personalities of each Foreteller becomes clear and I think their conversations will be interesting. As for the volume itself, because it's original, there are parts that don’t appear in the games. A volume is like a short story but currently I can’t talk more about the story. Nomura: That’s right. Because Aqua is the main character, it will become a story where she progresses in the Realm of Darkness. However, because time flows differently in the Realm of Darkness, it’s not simply 10 years. The beginning of the story will immediately begin after the secret episode of KHBBSFM. Since it is at the end of the story that may become spoilers, I can’t talk much about it yet. In the beginning of this story, just before we start our new journey in KH3, The King talks about reuniting with Aqua which has been kept secret, which will be the introduction. Please explain the meaning of the title 0.2 (A Fragmentary Passage)? Nomura: In regards to the volume, it happens after KHBBS which would be considered the second chapter. Because you’re not playing a full volume, the term Fragment was left as the subtitle. In KHBBSFM’s Secret Episode, the words 0.5 appeared and that implies a full volume so 0.2 was chosen to imply the other parts that were left. However, the remaining portion will be explained in KH3 and wanted to showcase a title that is close to it. With the announcement of KH3, we present a special feature on the increasingly eye-catching Kingdom Hearts series! 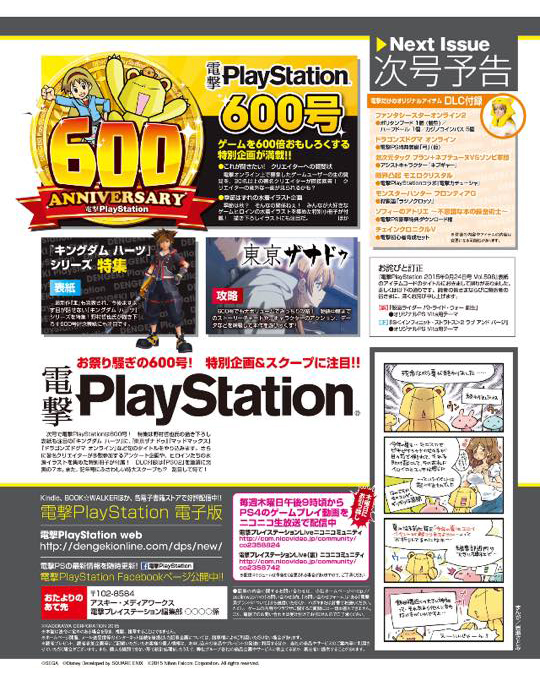 Also, watch out for out for the magazine cover especially drawn by Tetsuya Nomura to commemorate our 600th issue. Back Cover would just be a cinematic done in the art of the game, not fully 3D rendered and using the KH3 tech. That's amazing! Very, very excited about seeing the Foretellers in 3D-render with voices and personalities. Im especially looking forward to seeing all their respective ideologies clashing. Maybe we'll even have their faces revealed? I have a feeling that once the Xehanort saga ends, the new focus of KH will have something to do with the Keyblade War itself and the Foretellers as the main main focus. I think the concept behind Back Cover is both cool and infuriating. Cool because the Foretellers are among the most interesting parts of [chi] and will finally get a bit more backstory, infuriating because that hasn't be done in [chi] yet, even though the game goes on for over two years already. I wonder if the player story of [chi]/Unchained will have a satisfactory ending or if this part is also in Back Cover. Oh wow, so Back Cover is going to be like a fully rendered movie in the new graphics and everything. Oh man, this is going to be awesome. Nomura was right when he said way back when that releasing DDD HD as a standalone remaster would be not super exciting, and boy did he make 2.8 an exciting package. DDD seems like the least interesting part of this package now in comparison, despite that I can't wait to replay it to see if my opinion of it improves after playing it on PS4. I also love Nomura's art style so I'm looking forward to that magazine cover. It will be cool to see and hear the Foretellers speaking to one another. I wonder what kinda different motives and agendas they will have. 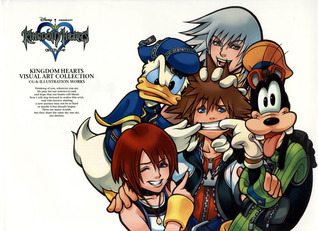 I know this is kinda of long-shot dream, but it would be really cool if the Nomura drawn cover would have the whole KH`s original cast in one big group picture. Like a redrawn version of the kingdom hearts 1 art but with the grown up versions of Kairi, Riku and Sora. I wonder if we will get a costume redesign for Donald and goofy? Are they even going to be Sora's companions in this game? Ah, confirmation that there definitely won't be a 0.5 or a full BBSv2. That's good to know. I'm excited for the movie. I think 0.2 is going to be a let down tbh. But I'd love to be surprised. KH3 takes place right after KH3D. You're not going to see him with longer hair. Ooof. I sure hope not. Really don't feel like waiting more than a year for this game. In the beginning of this story, just before we start our new journey in KH3, The King talks about reuniting with Aqua which has been kept secret, which will be the introduction. Oh man. So, it's true then. Mickey really did find Aqua again post-BBS. Either that, or I'm reading this wrong and what's it's saying is that Mickey is talking about reuniting with Aqua at the current point in the KH timeline, as in how they need to go find her, and not a previous time before the original KH1. In KHBBSFM’s Secret Episode, the words 0.5 appeared and that implies a full volume so 0.2 was chosen to imply the other parts that were left. However, the remaining portion will be explained in KH3 and wanted to showcase a title that is close to it. Oh this is good news. So, all the other stuff that was meant to be in Volume 2 that isn't in 0.2 will be included in KH3. Awesome. So, some bits of fragmentary passage from the Secret Ending of BBSFM's Secret Episode are included in KH3? I was a little worried at first that we may not get all of what BBSV2 promised so I'm relieved the rest will appear in KHIII. KH3 takes place almost exactly where KH3D left off, so it is impossible for his hair to have grown out in that span of time. If anything, the dumb manta ray stinger on the back of his neck should be cut off. Riku's hair getting longer again so soon kills the symbolism of Riku cutting his hair to begin with. Typically in Japanese media when a character cuts their hair, it is representative of a new beginning for them as they let go of the past. Riku didn't grow it out purposefully, but was rather another representation of how he neglected himself in order to do everything that was possible to protect Sora in the year he slept. This is the same guy who gave away his own heart & body to the darkness he had been in constant inner turmoil with for a year and gave up his own name just to make sure Sora was safe. His hair probably wasn't even anything he thought about at that time when there were just so many other issues to be concerned with. In terms of design, it is very rare that a character with silver hair has short hair so it is nice to see Riku with something unique. It'd be nice, especially if it is super quirky but I'm honestly hoping for one of Nomura's more refined pieces of art where he uses his serious style. What? Yes, they are Sora's companions in KH3. Have you watched the trailers? Oh my god I hope not. Christmas is a terrible time for new game releases that don't have Nintendo's name on them and 2.5 sales lagged at the start because of holiday sales. title. In KHBBSFM’s Secret Episode, the words 0.5 appeared and that implies a full volume so 0.2 was chosen to imply the other parts that were left. However, the remaining portion will be explained in KH3 and wanted to showcase a title that is close to it. Ooh, I missed this! So we might get some sort of flashback thing in KHIII? Really cool. I am interested to see what Kairi, Pence, Hayner and Olette were doing near the Old Mansion. With the Disney worlds potentially being more tied in to KH`s own story as was shown with BH6, and now hearing this, I am rather optimistic about the game. About Riku`s hair, I quite like his short hair. I enjoyed it even more when I realized that there is also symbolism behind it. 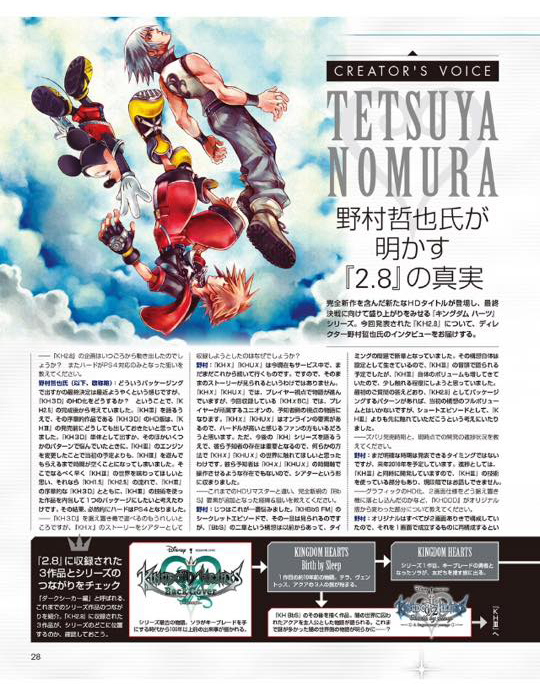 Nomura is Dengeki's favorite commemorative issue man. It is amazing that there have been 4 years since the last cover he drew. I remember when it was released! It's good to hear. I just hope they give Kairi a new design, because in the original teaser obviously she had her KH2 look. But if Sora's getting a new appearance, I don't see why she and Riku shouldn't get the same. Dengeki is a weekly magazine and this issue was 599, so like...this week. Of course they are going to get new outfits. They are the main trio of the series. They aren't going to have new outfits from the get-go, though. Sora will also start off in his KH2 clothes and then get his new outfit and hairstyle at some point in the game. Dengeki is a weekly magazine and this issue was 599, so like...this week.Of course they are going to get new outfits. They are the main trio of the series.They aren't going to have new outfits from the get-go, though. 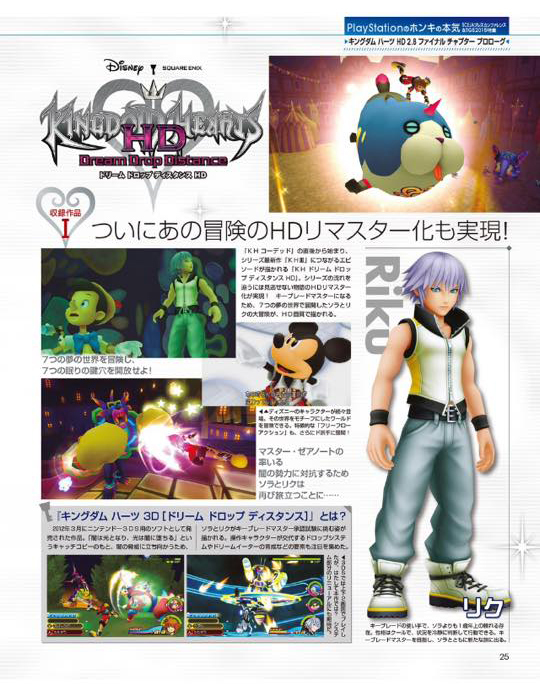 Sora will also start off in his KH2 clothes and then get his new outfit and hairstyle at some point in the game. Why would they hold off on releasing their special issue? Or you mean revealing the new outfits in this issue? 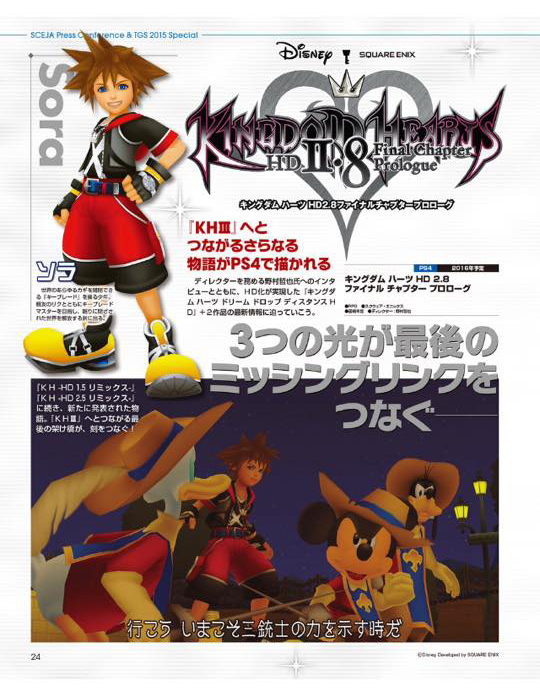 At best, Nomura would tease it but I don't expect anything from this issue. i mean why not hold this issure until kingdom hearts fan event since the 600 issue will have a feature on kh3 so why not release it on the day of the kingdom hearts fan event. It's not a feature on KH3, it's a feature on the entire series. Dengeki Playstation can't hold off on releasing an issue for a month! Oh Rem! Pure cinnamon roll too good for this world. This artwork is really great. I have seen it a few times, but now seeing it a bigger from really makes it shine. All those colors... Really makes me curious what Nomura makes for the 600th issue. A serious Nomura style art would be really welcomed. It'll probably come in really late (assuming and hoping it does) but it'll be worth the wait! !